Contest: #FigliaMyBeautifulSole #ShoeDesignContest extended to January 31, 2014! Flaunt your style and harness those imaginations to work at Figlia's My Beautiful Sole Shoe Design Contest extended until January 31, 2014! 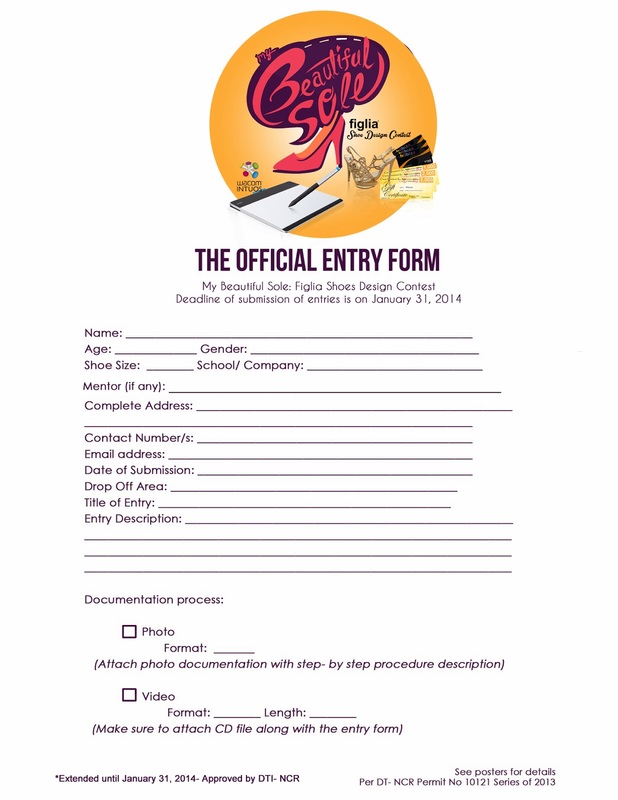 Open to all legal residents of the Philippines (at least a high school student), Figlia's My Beautiful Sole Shoe Design Contest started last November 15, 2013 and should have ended this December but Mr. Joey Enriquez would like to give more opportunities to students who need more time to create their shoe designs so he announced the extended deadline until January 31, 2014 at the bloggers' event last week at the Figlia Head Office. My students will definitely be happy knowing they have more time this holiday season to create their prototypes and impress their family and friends joining Figlia's My Beautiful Sole Shoe Design Contest. 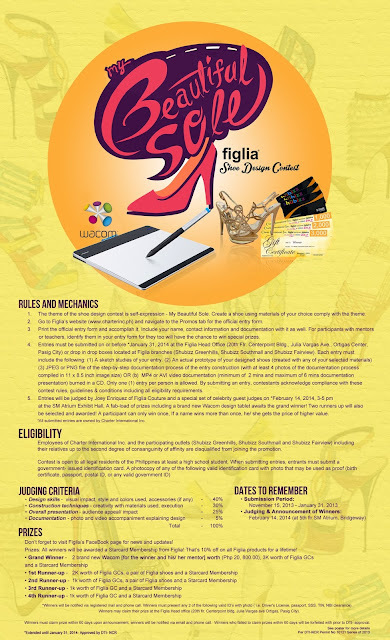 Aside from the bragging rights when your shoe design gets approved for sale at Figlia stores, up for grabs are : (2) brand new Wacom unit (for the entrants and his/her mentor) worth Php20,800, 3K worth of Figlia GCs and StarCard membership for the Grand Prize Winner, 2K worth of Figlia GCs and a pair of Figlia Shoes and StarCard membership for the 1st runner-up; 1K worth of Figlia GCs, a pair of Figlia Shoes and Star Card membership for the 2nd runner-up; 1K worth of Figlia GCs and a StarCard membership for the 3rd runner-up and 1K worth of Figlia GCs and a StarCard membership for the 4th runner-up. Submit entries to Shubizz, The Shops Greenhills branch, Shubizz Fairview or Shubizz Southmall on or before January 31, 2014. Each entry must include the following (1) a sketch studies of your work. (2) an actual prototype of your designed shoes (created with any of your selected materials) (3) submit along with the prototype (a) JPEG or PNG file of the step-by-step documentation process of the entry construction (with at least 6 photos documentation process compiled in 11 x 8.5 inch image size ) OR (b) MP4 or AVI video documentation (min. of 2 mins and max of 6 mins documentation presentation) burned in a CD. Absolutely no purchase needed to participate! You have this beautiful chance to use this beautiful holiday season to a beautiful cause making a beautiful shoe design contest at Figlia. I was actually surprised that Figlia is a Filipino brand since I've been using the brand for years and I thought then that it was a multinational company. The famous shoemakers in Marikina created Figlia along with other Charter Inc companies, Figliarina, ShuBizz, Sorores and more. Mr. Joey Enriquez shared to us how his father inspired him to create shoes and study shoemaking in Europe from their family's legacy in Marikina. Figlia reaches out and creates relevant marketing campaign making us all part of the shoe creation process with My Beautiful Sole Shoe Design Contest. Like what they say, You Feel Me? I Figlia! For more information visit www.charterinc.ph and like their official Facebook page at https://www.facebook.com/figliashoes and follow @figliashoes on Twitter and Instagram.